I made some orange chicken tonight for dinner, and lunch and dinner tomorrow. 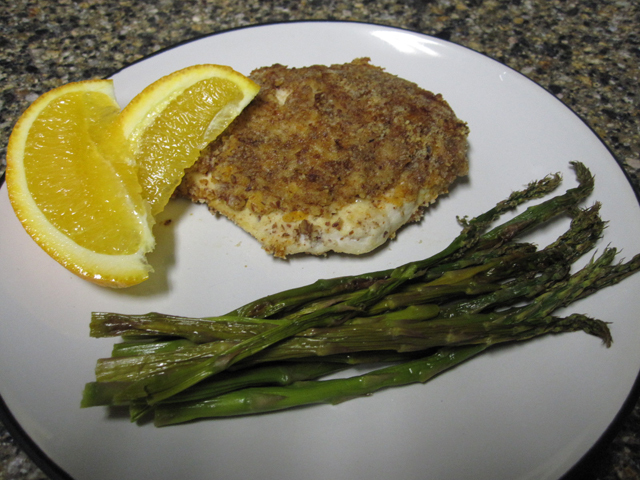 It turned out pretty good, not as crunch as i would have liked it but the "breading" was still pretty good. I would try the oven a little hotter in the future to see if it would crispen it up! Directions: Preheat Oven to 350 ( i would change this to 400). In a small bowl combing orange juice, mustard and soy sauce. On a piece of waxed paper combine almond meal, orange zest and red pepper. Pat dry the chicken. Brush on sauce and then dredge in the crumbs firmly pressing the crumbs to coat both sides. Place on a cookie sheet lines with foil and sprayed. Bake for 15 minutes, flip and bake anohter 15-20 minutes. Serve with sliced oranges. This was yummy and easy. Like I said, it wasn't as crispy as I would have liked. Make sure to flip the chicken with a spatula or you may loose some of the "breading". Also, if you are concentrating on weight loss, ALMOND MEAL IS ALMONDS. when eating recipes with almond meal, I recommend skipping any whole almonds or nuts throughout the day. Enjoy!